Is the River Otter an Omnivore? River otters are cute little creatures whose antics make them all the more captivating. You could watch them for hours without stopping to wonder whether they're omnivorous or not. You've seen videos and images of otters eating clams, fish and similar seafood fare, but there's more to these little mammals' diets than the meat lover's buffet. River otters who live in captivity, like the ones at the Oakland Zoo in California, get their meals served to them without the benefit of filling out a menu preference card. Typically zoo otters are fed between two and four times daily with fish, horse meat, boiled eggs, chicken or crayfish and a side of vegetables. At least twice each week otters in captivity are supplemented with vitamin E to help maintain healthy coats, and depending on the health of the otters, some zoos also supplement with a multivitamin. In the wild a river otter's diet is just as varied as those kept in the zoo, although a wild otter's food leans more towards the carnivorous. A wild river otter eats fish, crayfish, amphibians and will occasionally hunt down a bird or other small animal like a muskrat, beaver or rabbit. 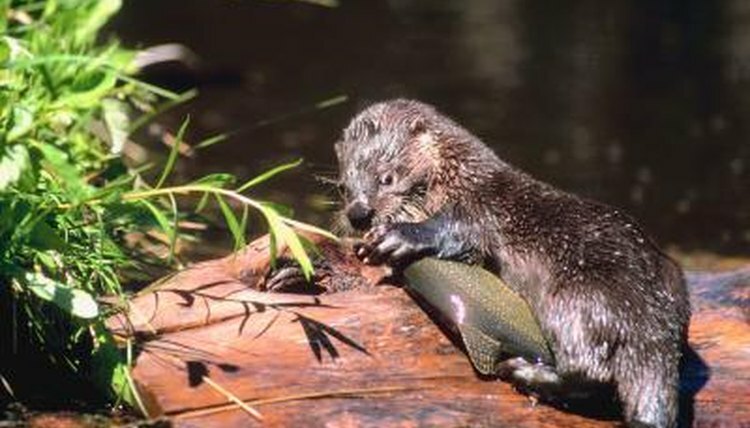 Otters usually forage for the slower-moving fish like carp or suckers, but once an otter has developed a taste for a specific species of fish, those are the ones it searches out. Even if their fish of choice is dwindling in numbers, river otters will still concentrate their efforts on finding the type of fish they crave. River otters are social creatures who don't mind banding together to seek out a quality food source. If a few come upon a school of herring, for example, the whole group, friends and family alike, will gather to feast on the find. Nutritious and succulent fish otters crave travel in schools large enough to feed a romp of otters, so the team effort in locating those schools is an ideal arrangement. Oxford Journals: Sociality in River Otters: Cooperative Foraging or Reproductive Strategies? Field Guide to Marine Mammals of the Pacific Coast; Sarah G. Allen, et al. Summary of Husbandry Guidelines for North American River Otters in Captivity; M. Owens, et al. What Does a Small Clawed Otter Eat?